Shopping for the elegant and pricey diamond ring is not an easy task. If you are planning to buy a diamond ring for your partner, proper research and knowledge is required before making your final choice. A diamond engagement ring is not just a ring; it is a symbol of love, care, commitment and loyalty. Here are some tips which can make your diamond shopping a pleasurable experience. Determining a budget for your shopping should be your very first step. If you have an idea about the amount you can spare, you will search for the ring of certain price range. This will make your shopping more convenient and fast as well. This is important because at the end you don’t want to buy a ring that fits tight. Stones are available in different shapes and all these shapes are quite popular among women. The cut or the shape of diamond ring is a matter of personal preference, some people prefer round while others prefer heart shaped diamond ring for example. Different available shapes are round, heart, princess, oval, pear, emerald, radiant and marquise. Solitaire ring : - These kinds of rings have a central diamond in middle which can be of any shape discussed above. No accent stones are placed around the central diamond. 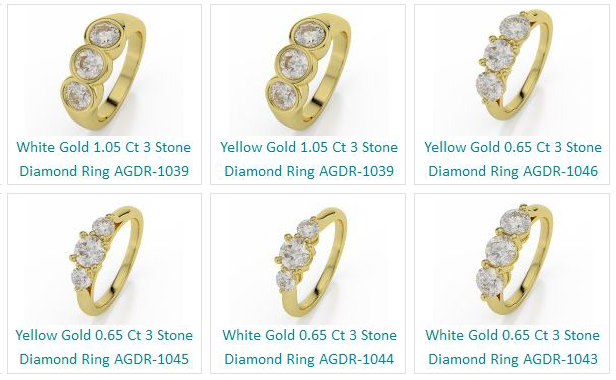 3 stone ring : - A 3 stone ring is a ring which has 3 stones. The size of these stones can be equal or it can be different in the case when central diamond covers more space compared to ones placed around. Ring with side stones : - Small stones (which are not diamond) are used as a complement with central diamond. It is possible that you will find out some more diamond settings but they are not as much popular as the above listed ones are. Till now you have set up a budget, decided the size, shape, setting and colour of the ring. Now it’s time to look for a reliable jeweller or a trusted site if you are going to purchase online. You can grab good deals online. It is also advisable to compare the price and different available options when buying a diamond ring. Always look for a trusted and reputed jeweler to make your purchase safe and secure. For example, when you are buying a diamond ring, you need to have a basic understanding of how diamonds are graded and what the common flaws are within the diamond crystal. I agree with your with your views everyone need to focus these points while buying any jewellery specially if you are ordering an bespoke jewellery. Such a great collection of the rings. I love with all the rings. Lizzy James have the wide collection of the rings where you can purchase designer rings at afforedable prices.